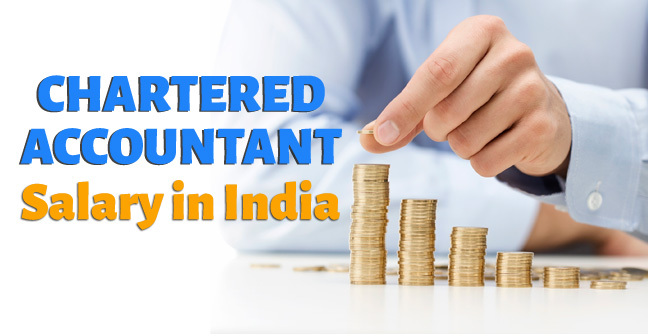 Chartered Accountant is one the most difficult but highly pursued a course by the Commerce students in India. There are many reasons behind pursuing CA as a career, and one of them is salary (package). There are various factors which play a major role in altering the chartered accountant salary in India such as the skills, capabilities, experience, and most importantly the rank in the examination. Also, there are some instances in which the students bags a good package on the basis of good performance in the interview. But still, the question remains that what will be the salary of a chartered accountant in India. So, to know in detail about CA Salary in India, go through the complete article. After carrying out a number of surveys, it is being found that the average salary slab of CA in India is 6 to 30 lakhs. But one thing we would like to mention that there is no upper limit of salary. It all depends upon the capability of the student. Below in the article, we have mentioned that Industry Wise CA Salary in India for the year 2018. Go through the complete article to know the package in the industry of your interest. Generally, CA Firms as their workplace is opted by the students who look to start their own firms in the future. At the CA Firms, the students aim to learn how to deal with the client, what is the flow of work in the CA Firms, how to handle the IT officer and much more. The average which the freshers get in this sector is between 3 to 8 lakhs. There are the companies who only pick the top rankers. So, try to get a rank among the top 50 students, if you are willing to have a job in these firms. The average salary slab for freshers in these companies is 18 to 28 lakhs. Again all depends upon your skills and presence of mind during the interview. Getting a job in the Big 4 companies that are E&Y, PWC, Deloitte, and KPMG is like a dream come true for the students. During the internship period itself, the students try their level best to get into these companies for the 3-year internship, so that in future, they can somehow manage to get jobs in the Big 4. A plus point associated with the hiring process of these companies is that they hire freshers in huge numbers. So, all the students are advised to try their luck. The average salary package which is being offered to the freshers in these companies is 6 to 8 lakhs whereas, for the experienced ones, these companies look to offer up to 25 lakhs according to their skills. Every student who is willing to join Big 4 in future, must keep a note that working in these firms is quite hectic. The great pressure of work at these place. Therefore, the one who handles it well goes a long way whereas the other leaves in a very short span of time. Getting a job is the public sector is a great thing to have. PSUs like BSNL, ONGC, BHEL, GAIL are few of the companies who are always seen at the CA Campus Drive. The students who possessed around 55% to 60% marks in the CA examinations have a great chance to get a good PSU firm in these Campus Drives. The average salary which is being offered by the PSU’s to the CA Freshers range between 7 to 15 lakhs. The only drawback associated with these firms is that the annual increment is quite low. IT Industry is again a big recruiter for the CA students. There are many IT companies like TCS, Wipro, Infosys who offers a handsome package to the CA freshers. Also, the load of work in these companies is quite low compared to the others. The average package offered CA officials in the IT industries ranges between 7 to 10 Lakhs. A bank is another good option for the CA students to get in. A number of freshers are being hired by the banks every year. The average salary which a student gets in banks ranges between 5 to 10 Lakhs. This is the chartered accountant salary in India in different firms. Hope you enjoyed reading here. For any queries, do comment in the section provided below.